The U.S. Mint launched a new $1 coin into circulation today that celebrates and honors perhaps the most noted former President of the United States. The Abraham Lincoln Presidential Dollar will soon be available at local banks and other financial institutions. Banks were able to order the coins from the Federal Reserve System and stockpile them beginning three weeks ago in preparation for the release. 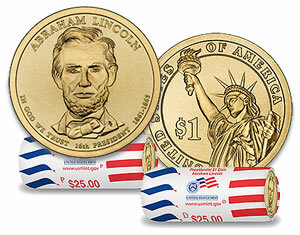 Lincoln $25 Rolls are now also available directly from the United States Mint for $35.95. 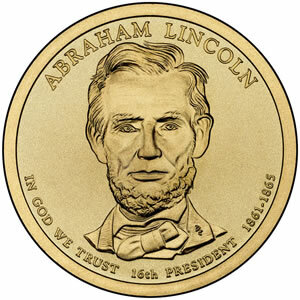 Each 2010 Lincoln coin honors the 16th President of the United States and marks the sixteenth coin released under the Presidential $1 Coin Program which debuted in 2007. Under the program, four former Presidents are celebrated annually with a new coin release bearing a portrait of the individual on its obverse. The coins are issued in the order upon which the individual served. To celebrate the Abraham Lincoln Presidential Dollar release, the Mint plans an official ceremony tomorrow, November 19, 2010, on the 147th anniversary of what may be Lincoln’s most famous speech — the Gettysburg Address. The ceremony will be held at the President Lincoln’s Cottage located on the grounds of the Armed Forces Retirement Home in northwest Washington, D.C. beginning at 10 AM Eastern (ET). Following the ceremony, guests in attendance will be given the opportunity to exchange cash for rolls of the strikes while children aged 18 and under will receive a free one to mark their participation in the event. Abraham Lincoln was born on February 12, 1809, in a one room log cabin in Kentucky. After moving to Illinois as a young adult, Lincoln first delved into politics when he was elected to the state general assembly in 1834 despite the lack of a formal education. Always willing to learn, Lincoln would become a self-taught, but successful, lawyer in the next several years. National attention to Lincoln first materialized in 1858 when he was pitted against incumbent Stephen Douglas for a spot in the United States Senate. Despite losing that race, Lincoln was not forgotten by many around the country, and would eventually be nominated for, and win, the office of President of the United States in 1860. His election was not without controversy, however, especially among the southern states of the U.S. Several began cessation proceedings which would eventually culminate in the American Civil War. Lincoln, who strongly believed in the Union, led the armed forces as Commander-In-Chief to a victory over the Confederacy. However, within days of the end of the war, Abraham Lincoln was assassinated by John Wilkes Booth, a Southern sympathizer. Having paid the ultimate price for his service to the country, Lincoln’s place in history is assured. Orders may also be placed by calling 1-800-USA-MINT (872-6468). Hearing and speech-impaired customers may call 1-888-321-MINT (6468). United States Mint Sculptor-Engraver Don Everhart designed the portrait of Lincoln that is featured on the obverse of the coin. Also shown are the inscriptions "ABRAHAM LINCOLN," "IN GOD WE TRUST," "16TH PRESIDENT" and "1861-1865." Everhart is also responsible for the image of the Statue of Liberty that is featured on the reverse of the Abraham Lincoln Coin as well as all of the other Presidential Dollars. August 19, 2010, was the date of the last release of a Presidential $1 Coin in this series when the James Buchanan coin was released.